With the RSPB's nature reserve an easy walk or short cycle ride away, and set within an SSSI important for wetland plant speces, Balranald has an obvious appeal for wildlife-lovers. But wildlife here in the Outer Hebrides - astonishing by any standards - is by no means limited to birds, and is certainly not confined to nature reserves! Balranald is well situated for wildlife excursions of every kind and in every direction, but even from the cottage windows, cottage, corncrake, short eared owls, hen harriers, kestrels and golden eagles have all been seen. The house door, opens to a utility room with space for wet clothes, boots etc, and with washing machine and tumble dryer. To the right, from the utility is a spacious kitchen with breakfast table and chairs, and a full range of applicances including oven, hob with extractor hood, microwave, dish-washer etc. 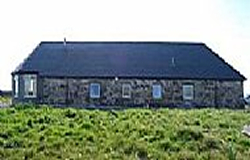 Large windows look out over the Balranald SSI and to the RSPB reserve beyond. A generous double bedroom with with en-suite shower room. Twin bedroom, with adjoining family bathroom. Beyond the living room is a large south-facing sun room, with large windows providing a wonderful panorama of white sands, a huge marsh and wetland SSSI, traditional small-scale machair farming, the Balranald nature reserve, and huge, huge skies! Balranald Cottage has double glazing and electric heating. Electricty is included in the tariff, subject to reasonable usage for the time of year. A non-refundable deposit of 20% is required to secure reservation. The balance is due six weeks before the start of your rental. Prices are inclusive of all bed linen, towels, electricity (Up to £40/week included) and broadband within reasonable usage. For lettings less than seven days or not starting or ending on a Saturday, or including the Christmas or New Year holidays, please enquire.